Having a beautiful cedar or wrought iron fence can create privacy and security to your home. Yet what about the driveway? For many people, they want to completely enclose the yards and control who can come onto their properties. Automatic driveway gates offered by Fence OKC allow for controlled access so the homeowner can pull into the driveway with their car without manually opening a gate. How Do Automatic Driveway Gates Work? How automatic driveway gates work. Automatic gates use a motor to control the motion of the gate door. How the gate will open will dictate the type of gate operator that will be required. Some driveway gates have a door that slides from left to right, while other automatic gates swing open and close. Check out how these gates open to decide on the right one to select as Fence OKC can install one for you. 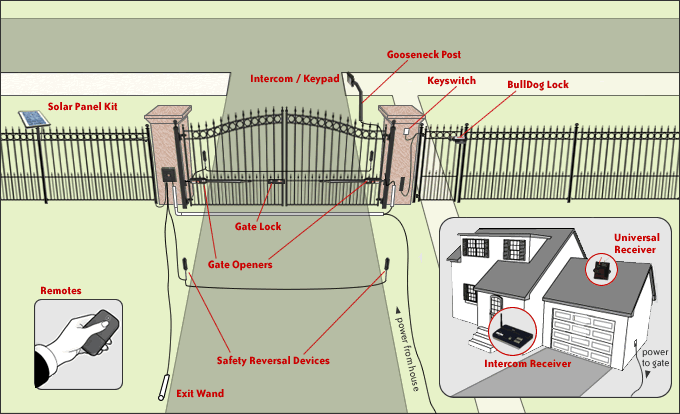 The image shows the general basic idea how automatic driveway gates work. There are many options available to when it comes to gate operators. This includes range extenders, video screens, cameras, solar, and electric eyes. There are also many options were you can access and operate your automatic driveway gate from an app on your smart phone. Sliding driveway gate in the open position. Think of a sliding gate in the same way as a sliding door on a home. These gates slide back and next to the fence line as they are convenient when there is not enough room to swing open the door. Some sliding gates have a track along the bottom of the driveway as there are rollers on the bottom of the gate. This method keeps the gate steady and in position while opening and closing. For homeowners who do not want a track along the driveway, they may have a cantilever system in place. When a car approaches, gate operators will slide the gate along until enough space is available for the car to pull into the driveway. Inside the gate operator is a motor and gearbox that operates a toothed track that is attached to the gate. The motor and gearbox are normally located behind a pillar or to the side of the gate so they are out of sight and less obvious. There are many different motor speeds available. You need to select the one that offers enough traction to pull the automatic gate back along the track. Automatic swing gate in the closed position. Swing gates are automatic driveway gates that swing open like a regular door. The gate may consist of one large panel door that swings from a gate post. There are also driveway gates that are bi-parting. These have two gates that swing open. Swing gates are ideal when you have enough property space without obstructing the gate doors as they come in a range of elaborate styles. Gate operators for swing gates can be installed on a concrete pad or on the gate itself. A pad installed operator system will have a motor attached to a lever. The lever is secured to the gate doors as the gate pivots open and close. The motor is normally located on a foundation base that the swing gate rests on. Gate operators mounted directly on the gate itself are basically the same as pad mounted systems, yet will have an articulated arm (also called a universal arm) or gate ram device that folds in and out to pull on the swing gate. You may see an articulated gate arm on wrought iron fences and a gate ram on wooden fences. When it comes to automatic driveway gates. You’re only limited by your budget. There are about as many gate access systems as there are gate design styles, as Fence OKC can help you decide on the right one for your needs. Often, the type of access will be based on your budget and how you want to interact with your automatic gate. Some automatic gates can operate much like a garage door opener with a remote control that you have in your car. Other gate openers will open using a sensor that may be located along the ground or attached to the gate door. When a vehicle comes within range of the sensor, the sensor will send a signal to the gate operator to open the gate. When the car moves out of the range of the sensor, it will automatically close the gate. Keypad and card access are commonly used for commercial gate openers, yet may also be of benefit to homeowners. A homeowner will have a pin number that they can key into a keypad located by the gate at car window level. A card access system requires a card to be inserted or swiped into the machine. The card will have an RFID chip that is read by the access system. 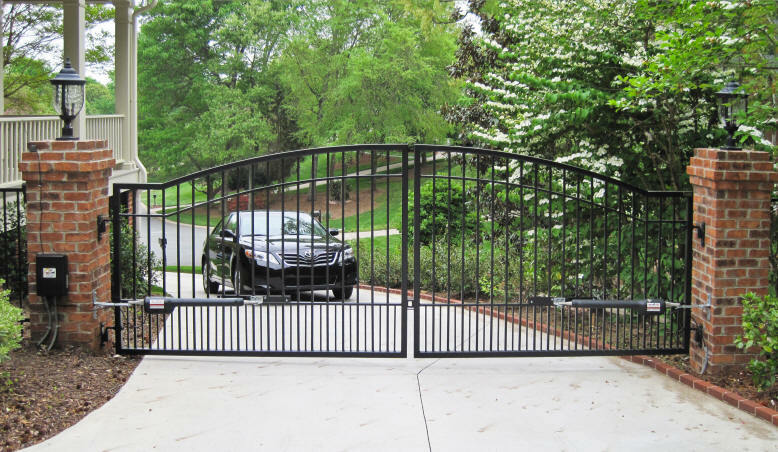 There are several factors that you have to take into consideration when deciding on the right driveway gate system to use. You have to consider the space available at the end of the driveway, how you want the gate to open, and the type of gate access to use that is most convenient and secure. In addition, you need to consider the slope of the driveway. If your driveway is sloped or uneven, some systems, such as sliding gates on tracks, can be hard to operate. People love automatic gates due to the increase of safety and privacy that these systems offer to homes. Contact Fence OKC to learn more about your automatic gate options and to have our staff install one for you. If you are considering an automatic driveway gate for your residence. Contact the professional fence installers at Fence OKC. We can install custom and pre-made fences for your property as well as for ranch and farm areas. Call us today for a free estimate and let us provide you with a beautiful fence that can offer you privacy and beauty to your home. If you still have questions on what type of fence you should install. We would love to talk to you about your project. Please feel free to reach out to us online. Or better yet give us a call at 405-778-1545 for a free consultation and estimate. If you’re in the Oklahoma City area, come check out our new indoor/outdoor showroom “OUTDOOR LIVING” located at 8302 NW 39th Expressway Bethany, Oklahoma 73008.